If you think you are weak when it comes to dealing with numbers and figures, don’t get held back from playing Sudoku. Once you play Sudoku, you’ll definitely think otherwise. Although this game involves the use of numbers, you won’t need the skill to add or subtract because the only thing you’ll ever use is your logic. Whether you are having a bit of difficulty when it comes to numbers or you are complete mathematics prodigy, there are apps that will certainly keep you entertained for hours. We’ve selected one game for you today, called Sudoku S.
Sudoku S. is a logic-based number puzzle game, released on the Android platform a while ago, suitable for all ages. If you want to play random games to earn XP and train your skills, now you can do it for free. 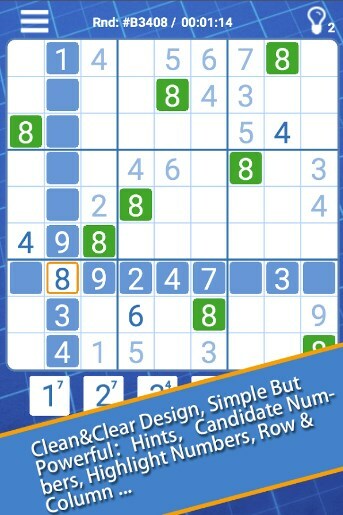 Sudoku S. offers easy-to-edit big/small numbers, without tedious process, and no break thoughts, plus it is designed with clean interface and neat controls for touch screens. The main objective in this game is to fill a 9×9 grid with digits so that each column, each row, and each of the nine 3×3 sub-grids that compose the grid which contains all of the digits from 1 to 9. Each puzzle has only one solution. Before you start playing, you can choose from 5 different difficulty levels: Flash, Easy, Normal, Hard and Evil. Also, you can play a random game or a daily challenge (that is if you want to compete with other users, earn XP and climb up the online global leaderboard). What we love the most Sudoku S. is that it even teaches you the most famous Sudoku techniques, such as Hidden Single, Naked Single, Hidden Pair, Naked Pair, Pointing, Claiming, X wing, Swordfish, and so on. Watch the YouTube videos and enhance your skills immediately! Can you become the master of Sudoku? Download this awesome game from Google Play and see it for yourself – it is totally free! Google Play Download Link: Sudoku S.